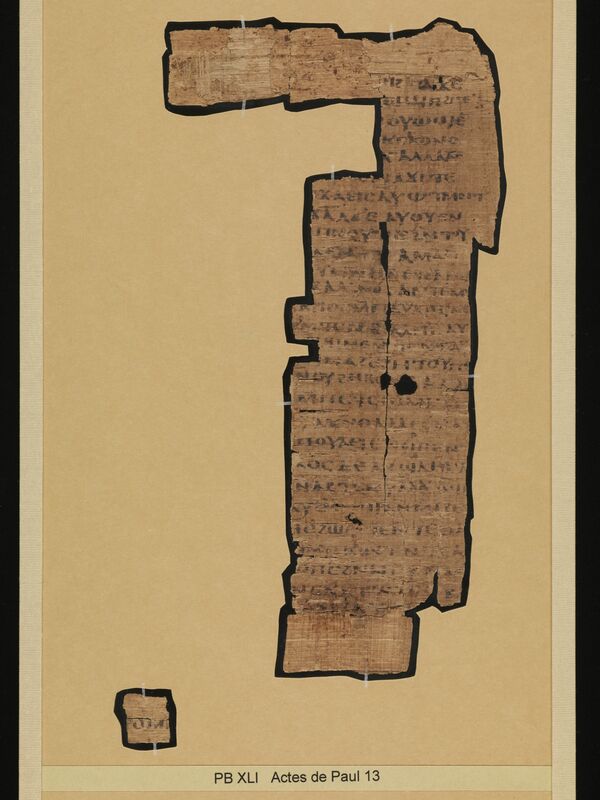 Seven leaves of a papyrus codex containing a portion of the Acts of Paul in Coptic (L56 dialect). 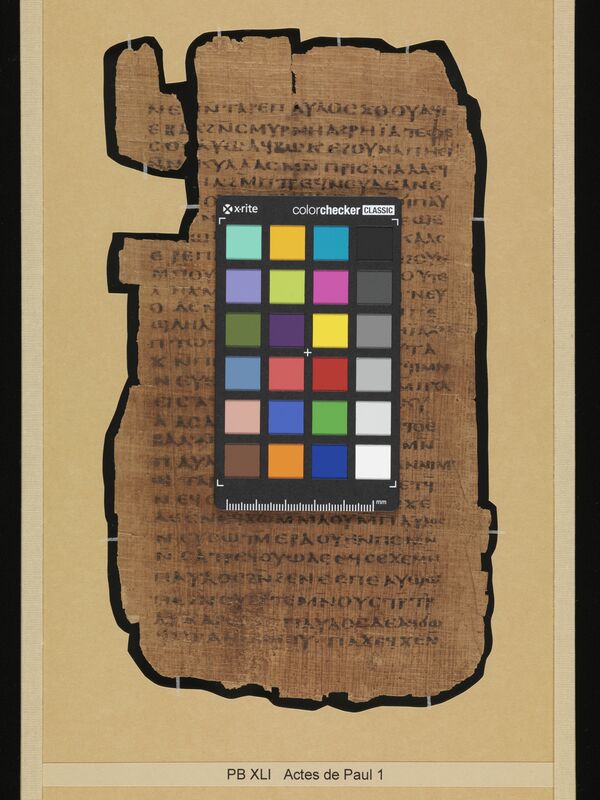 Description: The seven papyrus leaves that make up P.Bodmer 41 narrate the “Ephesus episode” known from other copies of the Acts of Paul. The pages of P.Bodmer 41 were numbered in the upper margin, but the numbers are only preserved on the leaf containing pages 13-14. One leaf (containing pages 5-6) seems not to have survived. The 6 letters unique to the Coptic language are spelled out at the end of the text in the hand of the original scribe. The leaves making up P.Bodmer 41 are said bought by Martin Bodmer from an antiquities dealer in Cairo around 1956 (Kasser and Luisier, “Le Papyrus Bodmer XLI,” 281). CopistesThere are two copyists. The first hand writes in upright majuscules using black iron-gall ink. The second hand, found only in a small addition on the last page, writes in a majuscule using black soot-based ink (Kasser and Luisier, “Le Papyrus Bodmer XLI, 288). Date et lieu de créationsecond half of the 4th cent. (Kasser and Luisier, “Le Papyrus Bodmer XLI,” by palaeography). Dimensions: The width of the page is 13.0 cm. The height of the page is 22.8 cm. The ratio of the page (width/height) is 0.570. The writing is in a single column. The width of the written area is about 10.0 cm. The height of the written area is about 18.2 cm. There are 29 lines per page. There are 7 extant folia. Quires: The seven leaves are currently mounted under glass. Horizontal fibers precede vertical fibers on all leaves, suggesting that the leaves come from the first half of a large single quire (Kasser and Luisier, “Le Papyrus Bodmer XLI,” 284). Cover: No cover is extant. Binding: The binding is not preserved. Paratextual features: A line of diples are underscore the last line of text on the last page. Below this sits the title, in the singular form, ⲡⲣⲁⲝⲓⲥ ⲡⲁⲩⲗⲟⲩ, framed by horizontal lines. The pages were numbered in the upper margin. 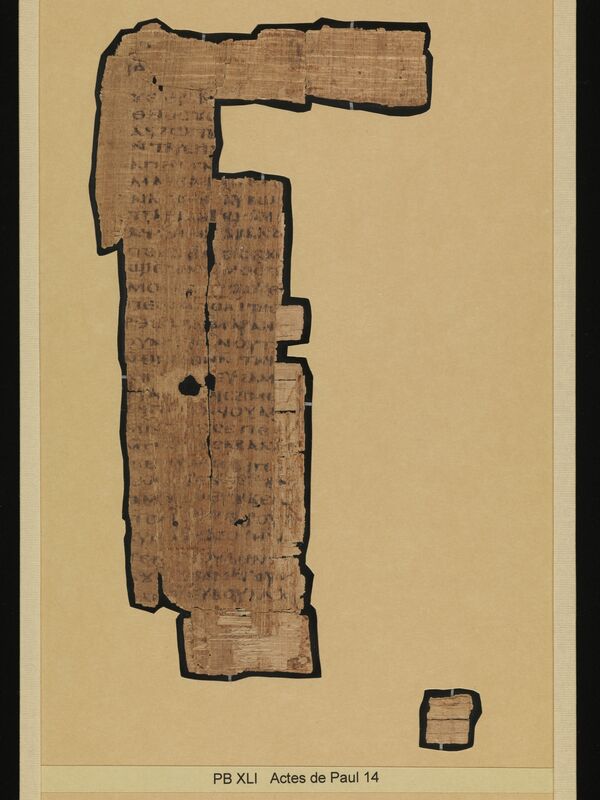 RésuméSeven leaves of a papyrus codex containing a portion of the Acts of Paul in Coptic (L56 dialect). Kasser, Rodolphe and Philippe Luisier. 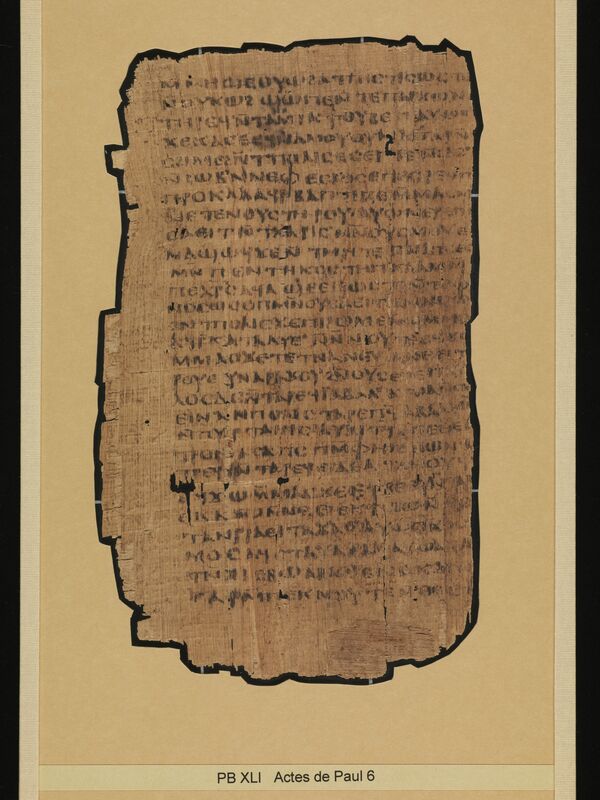 “Le Papyrus Bodmer XLI en édition princeps: L'épisode d'Éphèse des Acta Pauli en Copte et en traduction.” Le Muséon 117 (2004): 281-384. Snyder, Glenn E. The Acts of Paul: The Formation of a Pauline Corpus. Tübingen: Mohr Siebeck, 2013.